A cheese flavoured with beer – that truly is something to savour. Beer cheese Paulus - Abbey cheese is produced to an authentic recipe from Gouda, using only the best Dutch milk. We then add a unique beer, made ac-cording to the traditional method used at the Paulus Abbey, and ripen the cheese for about eight weeks until the flavour is just right. A cheese flavoured with beer – that truly is something to savour. 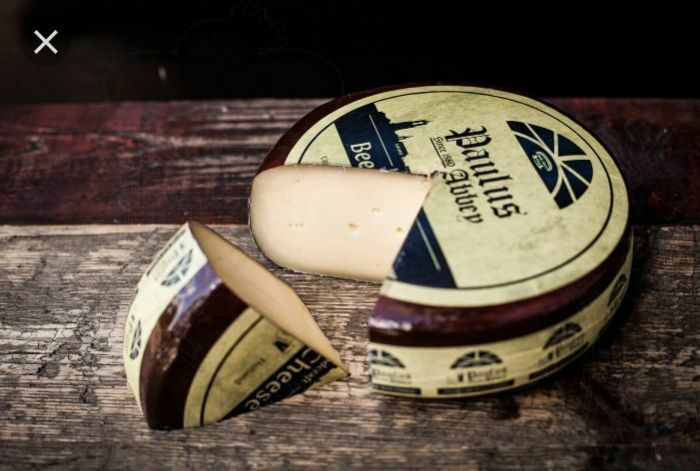 Beer cheese Paulus - Abbey cheese is produced to an authentic recipe from Gouda, using only the best Dutch milk. We then add a unique beer, made ac-cording to the traditional method used at the Paulus Abbey, and ripen the cheese for about eight weeks until the flavour is just right. The result is a fine Dutch Gouda that blends the gentle saltiness of a well-matured cheese with the fresh, slightly bitter fruitiness of Paulus Beer. A cheese that will leave you wanting more. Your beer cheese is freshly cut and vacuum-packaged!